So this post is the last post for Food Network’s summer fest. It was really fun participating and trying out new recipes. Especially I really stepped out of my comfort zone for my Tomato – Basil ice cream. I am so proud of myself. Back to the summer fest, this week’s main ingredient is “Broccoli”! I used to hate this green weird looking vegetable till I had amazing pita pockets at one of the Greek restaurants in Pocatello,ID. And that had fried broccoli in it so there was nothing not to love about it. So I started experimenting and now I really like broccoli. But I still cannot eat it raw :(. At first I wanted to post about Roasted broccoli soup but it did not come out well. If you have nice recipe for that, please leave a note below. It was a bummer. 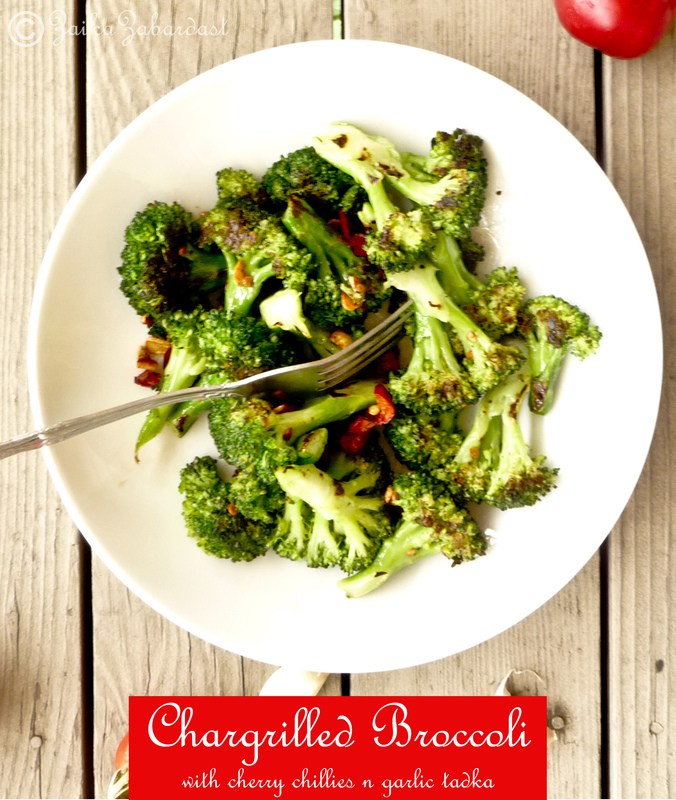 So rather than experimenting on new stuff I thought to share our favorite Char grilled Broccoli (side) dish. Actually I will not just call it a side dish, because it is good as salad or I can just eat it as my main dish. It goes very well with marinated minty tofu n rice. You won’t imagine what bit of char-grilling, chilli and garlic can do. Just give it a try. You will start loving broccoli even more. I guarantee that. Also do not forget about my “Brown bag challenge”!! This is what I had for my lunch today. Separate the broccoli into florets and blanch in boiling water for 2 minutes – don’t be tempted to cook longer! Remove immediately to a bowl of ice water, then drain and leave to dry completely. Use paper towel if needed. 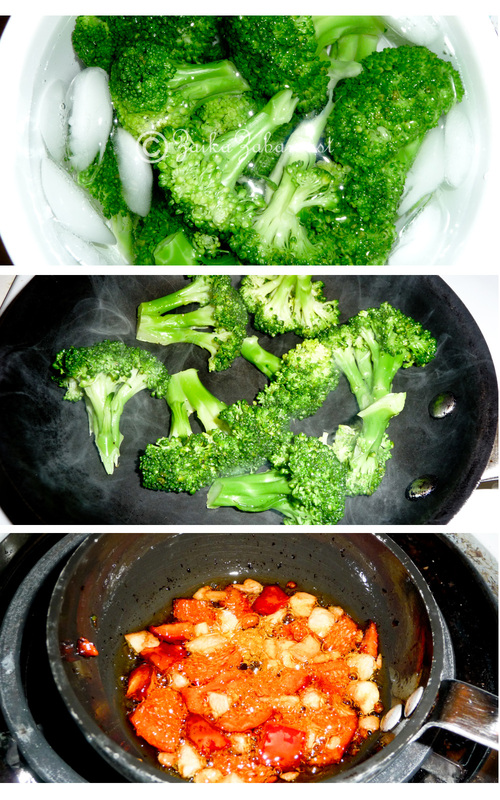 Once the broccoli is dry, toss with 3 Tbsp of the olive oil, soy sauce and a generous amount of salt and pepper. Place a griddle pan on high heat and leave for 5 minutes until smoking hot. Grill the broccoli in batches on the hot pan, turning to get lovely char marks on all sides. While the broccoli is cooking, you can prepare tadka for it. Place the remaining oil in a small saucepan together with the garlic and chillies and cook on a medium heat until the garlic begins to turn golden brown. Be careful not to let the garlic and chilli burn – they will continue cooking in the hot oil even when off heat. Also check out hoe other bloggers are enjoying Broccoli. My Question for you: How do you like your Broccoli? Leave a comment below. 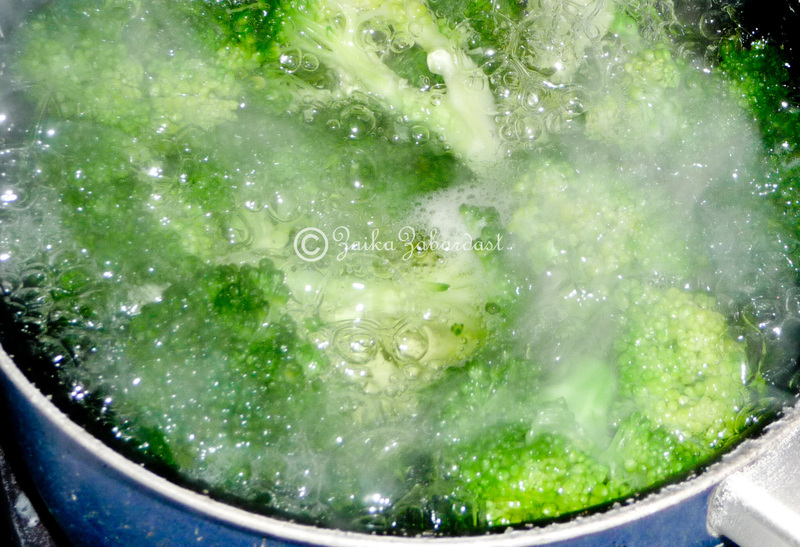 Beautiful pictures 🙂 you even caught the steam of the steaming broccoli …. nice. Yummm.. i like mine quite similar.. in garlicky soy sauce or in achari spices! a similar base as pickled eggplant curry.! Thanks Kiran 🙂 hot sauce n garlic sounds yummy as well. Would like to try it. Arvind loves boiled broccoli with lil bit of butter on it. There was a time when I couldn’t enjoy the taste of it but, these days I enjoy it a lot. This is a great recipe u shared. My little one can eat a raw broccoli just like that. Every other day I have to put broccoli in her lunch box. I am guessing she might like this twist! I could eat bowlfuls of broccoli served this way. I’ve never managed to make roasted broccoli soup since I end up eating them just by themselves 😀 Found my way here through your comment on another blog and glad I came by. 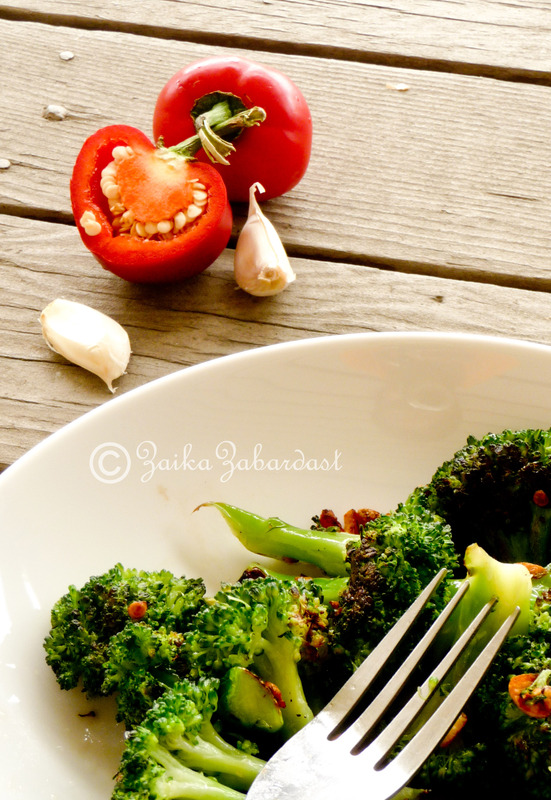 This looks absolutely delicious.. Tadka style broccoli is very creative n absolute treat.. Kudos!!! This looks so good!! Love the idea of using a tadka! Mom always uses it with dal, but very smart to put it with vegetables. Great pictures too, Grishma! Grishma, it was so nice chatting with you and your husband this evening. Can’t wait to browse through your blog to find some delicious veggie recipes! I so have to agree this is a great way to eat broccoli. Love the freshness of greens…Your recipe is amazing. I’ll do away with chili though, my spicy threshold is not that high. Keep posting! Thank you Anna, it should taste great without chilies as well. But if you prefer, you can sprinkle a dash of crushed red pepper instead.